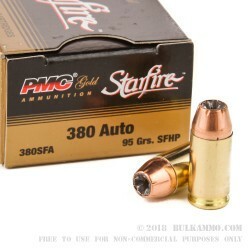 Jacketed hollow point bullets like the Starfire have made the .380 Auto cartridge a strong contender in the self-defense market. 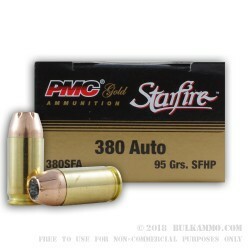 The Starfire round, manufactured by PMC, weighs 95 grains in its .380 ACP version and leaves the muzzle at a velocity of 925 feet per second. 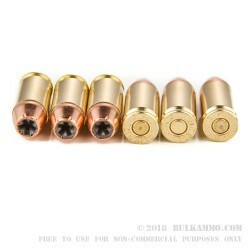 Each box contains 20 rounds with high quality reloadable brass. Designed by renowned handgun bullet designer Tom Burczynski, Starfire rounds use a patented rib and flute structure to provide reliable expansion to twice the bullet’s initial diameter. The round also boasts above-average penetration characteristics. The Starfire JHP round enables .380 pistols such as the Kahr P380, Ruger LCP, Sig P238, and Colt Mustang to punch above their weight and offer effective personal protection in a compact, CCW-friendly form factor. 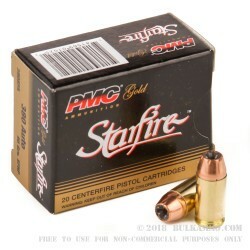 Best known for its high-quality, affordable range ammunition, PMC has ventured into the self-defense market by manufacturing ammo with the proven Starfire round. PMC belongs to the Poongsan Corporation, a major armaments manufacturer in South Korea and a supplier to South Korea’s armed forces.